To conclude our recent posts on Bohemianism, both as a movement and as an interior style, we thought to put together a little style “starter kit”. 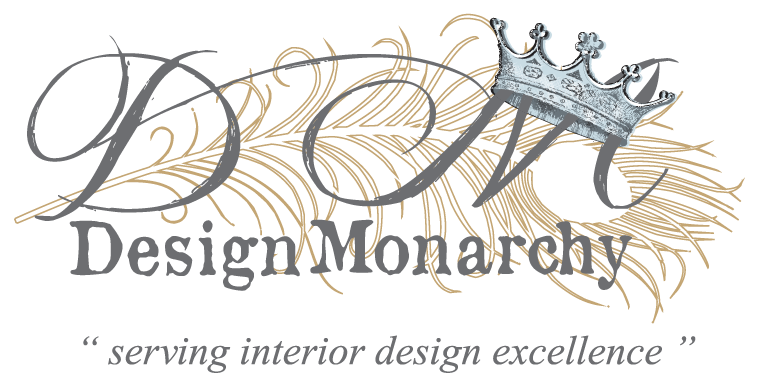 Not to long ago we enlisted the services of Fibre Designs during one of our recent interior design projects. We had found the perfect rug for the space and budget, but it was too big. That can be quite disheartening. Our rug specialist Bev Walters referred us to Fibre Designs as rug repairs and alterations (including that of speciality rugs) are part of their services. They did a sterling job of reducing the size, while still retaining the flow of the pattern on the rug. This is such a rare service we felt we had to share it with you. 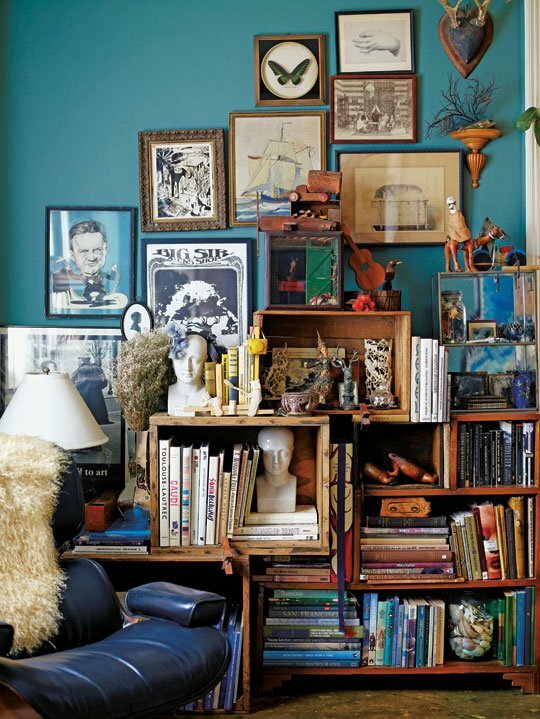 I once heard someone refer to the Bohemian interior style as “curated chaos” – what a fitting description! A true eclectic style, it is definitely not for the faint of heart or the minimalist! The spirit of this style is about individual, artistic expression. If it is weird or bright it belongs in a Bohemian interior. The style is also informal and laid-back – a space to slouch and lounge. Nothing stiff, nothing symmetrical – and of course not a bare spot in sight. If I had to encapsulate the Bohemian Style in only three words it would be: colour, pattern, layers. I am quite in love with the more simplified “New Bohemian” style that we are seeing so much of lately. A fusion between Bohemian and Scandinavian interior styles, it is slightly less tatty, worn and cluttered. The best of both styles, it comprises out of a fresh, minimal Scandi backdrop with colourful and interesting pops of Bohemian aesthetic. As I mentioned in my previous post, A Bohemian History, the Romani “gypsies” are said to have originated somewhere in India before travelling to Europe in the 13th century. It is therefore not surprising that today’s Bohemian Style contains some Indian influences especially if you look at the use of colour and pattern. The Hippie era provided a fresh injection of borrowed global culture and style. Marrakesh was seen as an exotic utopia. Moroccan influences soon found its way into the Bohemian style. Can you imagine a Bohemian interior without some Moroccan textiles, tiles or those metal hanging lanterns we so love? The truth is many cultures and countries have contributed to today’s Bohemian Style. We often see elements of Victorian England, the Far East, the Native Americas, African Tribal design and Scandinavian and Slavic folk-art, to mention but a few. Other than texture and textile, one of the most important (not to mention one of my favourite) aspects of a good Bohemian interior is colour. 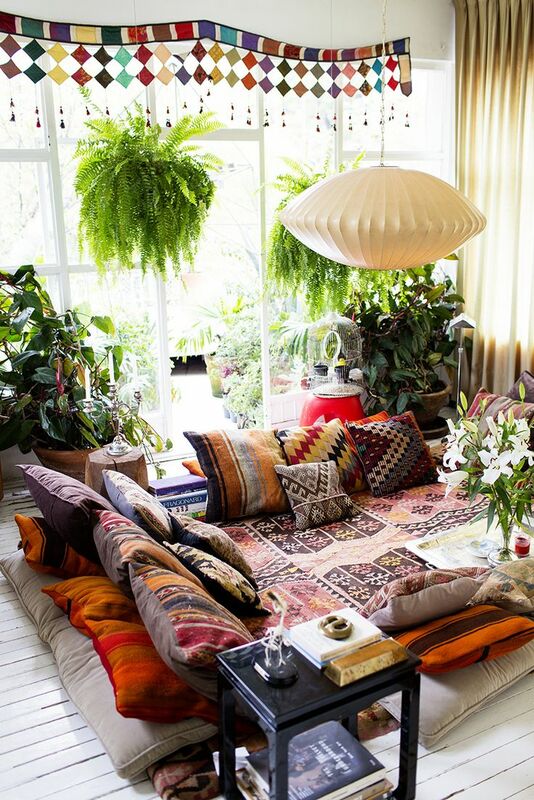 When I think of a Bohemian space I think of a foundation consisting of warm, rich, earthy colour. Use jewel tones like deep purple, fuchsia pink, ruby red, flaming orange, emerald green and sapphire blue to liven up your space. 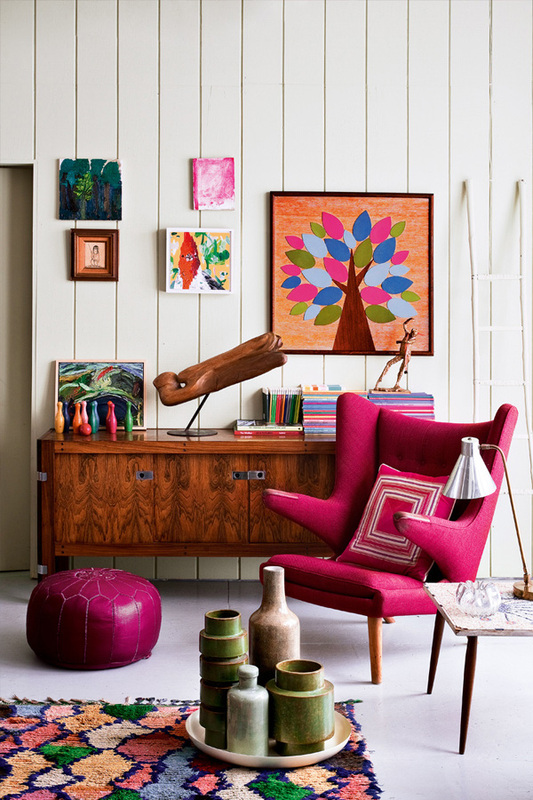 Bright colour – heaps of it – and don’t be afraid to use different colours together. If you are interested in creating a Bohemian interior with a clean and minimal Scandinavian undertone keep the backdrop of your room neutral or crisp white. Use your accessories and soft furnishings to incorporated colour and depth. Do you know what is better than having pattern in your Bohemian space? That’s easy! Having MORE pattern – pattern on top of pattern! A mixture of paisley, suzani, ikat, folk prints, tribal designs even Victorian florals or eastern-inspired Chinoiserie patterns all work well together in a Bohemian interior. Textural contrast adds another distinctive layer to a successful Bohemian-style room. Rough and worn, smooth and silky, woven and plush – it all contributes to the depth of the interior. Try to incorporate loom-woven textiles and tapestries, velvet, chenille and silk, embroidered fabrics, crochet or macramé, worn leather, plush weaves or furs, and of course delicate sheers and voiles. Floor? What floor? You’re not supposed to see any floor! 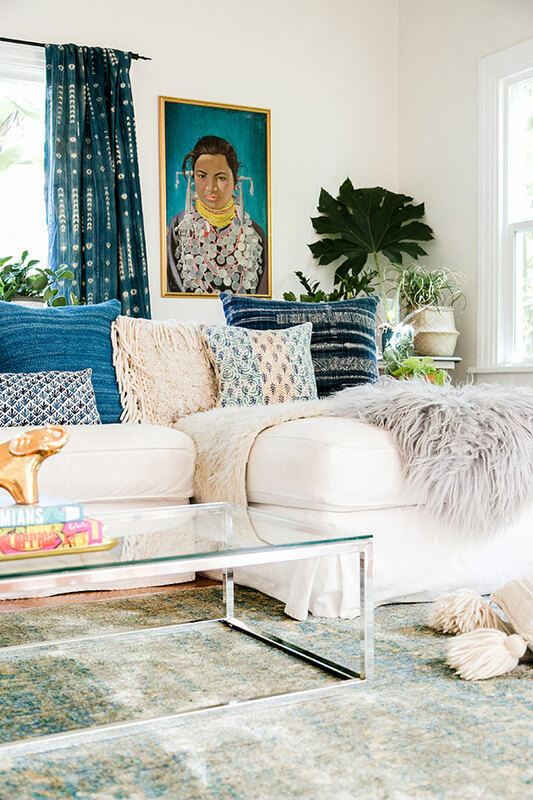 Bohemian Style is all about the rugs. You can layer rugs of different designs and sizes over each other – think of a scene straight out of Arabian Nights. Rugs that work well in a Bohemian interior are those of an ethnic persuasion – Kilim, Persian, Boucherouite, and even Native American designs like that of the Navajo are popular choices. You can also opt for a faded floral number or the trendy “reloaded” patchwork rugs. Beni Ourain rugs are the ideal lighter option to compliment a more Scandinavian Bohemian interior and the plush pile adds loads of texture. And why stick to the floor when you can hang them on your wall? As we mentioned above, several cultures have left their stamp on the Bohemian Style of today, many of them floor-lounging cultures. It is not surprising then that a large portion of a good Bohemian interior should consist of cushions. Piles of cushions! Beds and lounge sofas should be scattered generously with cushions of every shape. Mix up the colour, pattern and texture of the cushions – no plains here. Cushions made from tapestry textile, like kilims, are an excellent choice. Use a combination of striped, small patterned and big, bold patterned cushions. Add a fluffy or tasselled cushion as contrast. Oh, and don’t forget the floor cushions and poufs! Every living room should have at least two. Round Moroccan leather poufs are a must – and they come in every colour under the sun. Match it with a woven or chunky cable-knit floor cushion or pouf for extra depth. A Bohemian interior should be one big museum or gallery of your most treasured objects and art. Even in a more contemporary or Scandi version of this style, Bohemian is all about filling the empty space. More is more. Create vignettes or groupings of one of a kind pieces – figurines, decorative boxes, beautiful ceramics, mismatched china, vintage bottles and other collectables – everything should tell a story. Walls should be filled with interesting, and sometimes bizarre, art. Build a wall gallery of artwork, prints, maps, ornate frames and mirrors and curious decorative items. 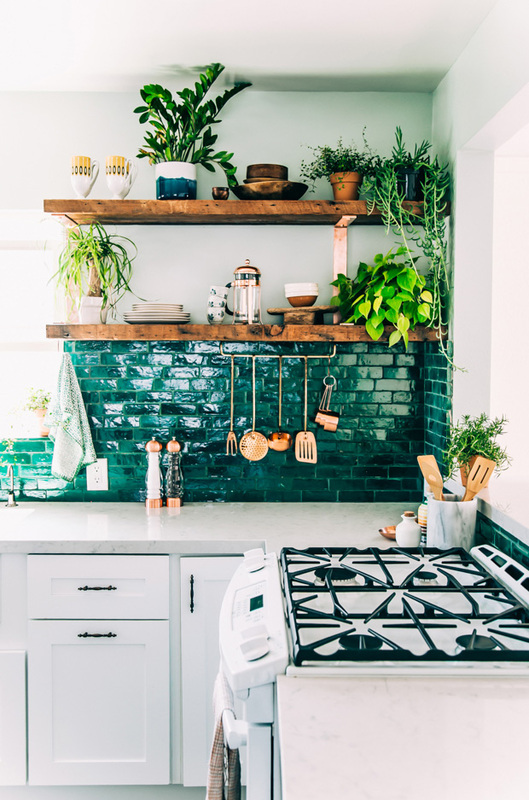 I am not quite sure how indoor plants became such an important part of this style, but if your house is not part-jungle you are doing Bohemian wrong. 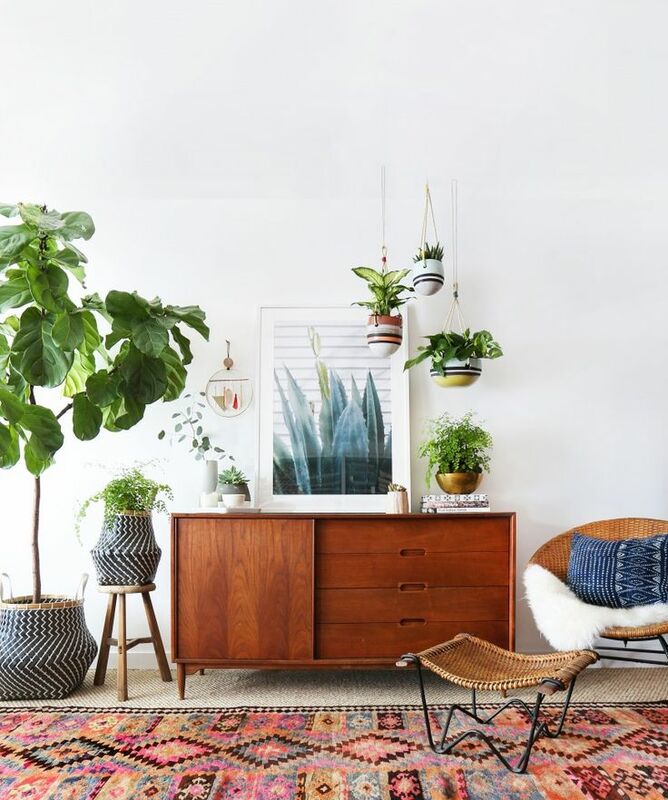 Live plants are the ultimate accessory in any Boho room. Opt for a variety interesting and beautiful planters and containers – the pot is as much a feature as the plant. Hanging planters are an excellent choice – group them together and hang them at different heights. Select plants with long dangling foliage, an attractive succulent like Burro’s Tail (Sedum morganianum) would make quite the statement. The brave Bohemian can also consider introducing creeping plants into their interior. Add an interesting trellis for plants to climb or forgo the latter and let them grow all willy-nilly directly up your wall and ceiling. Pop down to your local nursery to get some ideas on what plants are well suited to indoor environments. Ferns are often a go-to choice. For those not blessed with green fingers, try low maintenance succulents or self-contained terrariums. The Bohemians of old didn’t own much furniture. The Romani are travelling folk – lugging around big pieces of furniture is not really an option. The Parisian Bohemians were poor artists; most of the furniture they owned were salvaged or inherited. Nothing matched. Troll second-hand shops or flea markets for interesting vintage or antique finds. Like with your decorative items, choose furniture that tell a story. Carved or ornate furniture pieces with distinct Eastern or Middle Eastern influences are a popular choice. Don’t hesitate to include furniture from multiple style eras. In a Bohemian interior a Victorian chair can easily sit next to a mid-century modern server or a distressed shabby chic chest of drawers. Man, don’t you just love the idea of a comfy English sofa in worn jewel blue velvet? I sure do! 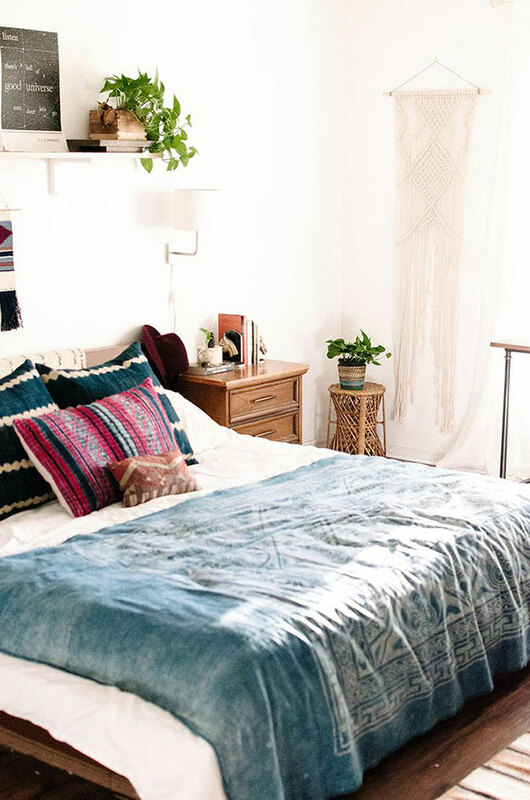 Oh, and by the way – if you are going to do a Bohemian bedroom – it’s floor bed, canopy bed or nothing! Another element often associated with Bohemian interiors is billowy tent-like drapery and hangings. Interesting curtains can be both decorative and functional, use a well-placed curtain to create privacy or to separate various areas. 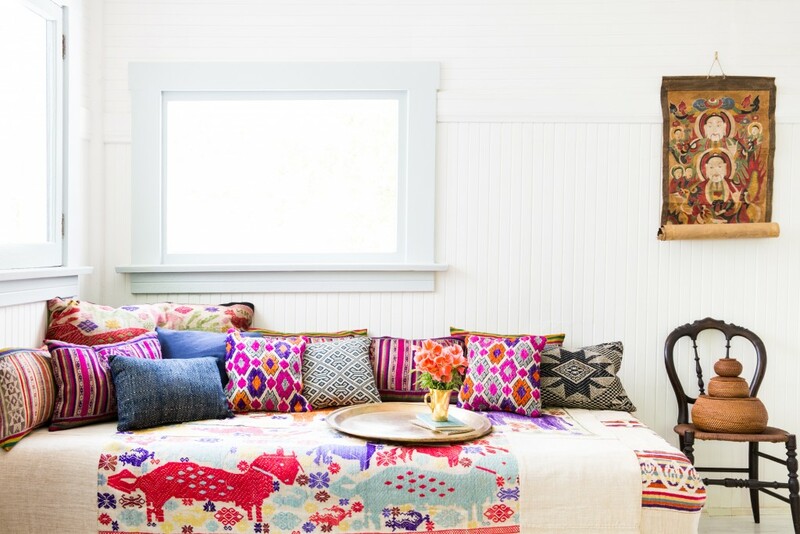 For the hippie-chic look use curtains or hangings made out of crochet, macramé, rags or patchwork. Feathered or beaded curtains are an obvious choice, but use with discretion. Shawls, scarves and pashminas make superb throws and canopies – anything with fringes, tassels or lace can and should be used. Well, aren’t all Bohemians well-read artists at heart? In my opinion, books are a vital Bohemian accessory. Bohemian homes should be artistic, intellectual sanctuaries. Untidy bookcases or informal stacks of books are a must. Fill them with your favourites – poetry, interesting biographies, and books on art and design. Be sure to include a few novels by great Bohemians like Virginia Wolff or Hemingway. Les Misérables by Victor Hugo or Vanity Fair by William Makepeace Thackeray are excellent Bohemian reads. …What is more Bohemian than that? What do you think? Can you do a New Bohemian interior? 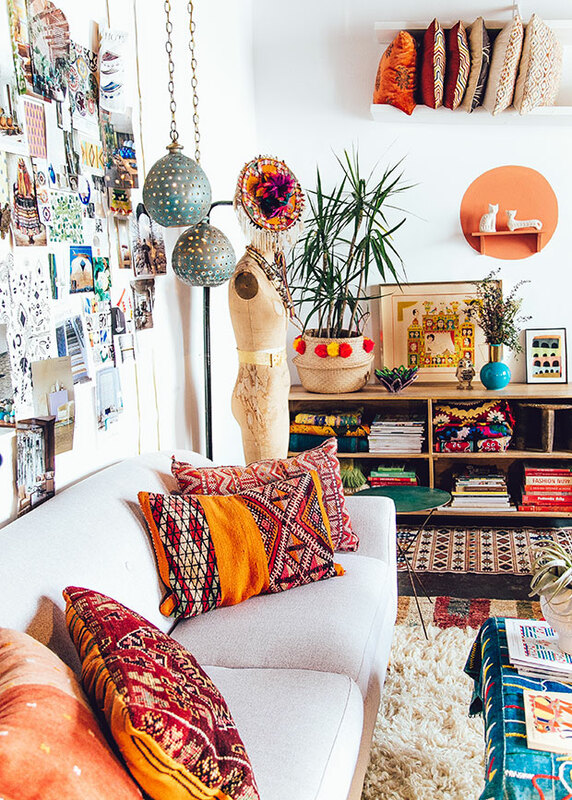 I have always been an admirer of the semi-chaotic, colourful and creative Bohemian Style, both in fashion and interiors. Rose and I recently had an interesting discussion on the origins of today’s Bohemian Style. We both wondered why, in contemporary usage, the term “Bohemian” pertains to people who live unconventional, usually artistic or intellectual, lives. 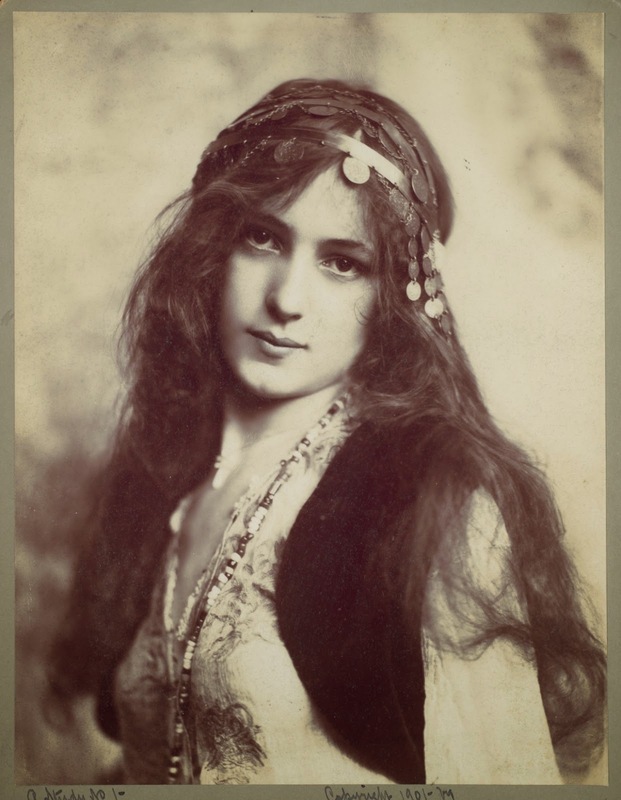 Bohémien was a common (yet inaccurate) term for the Romani or “Gypsy” population of France. They were mistakenly thought to have reached France via Bohemia when in fact they are said to have originated in India, arriving in Europe roundabout the 13th century. Perhaps this explains the Indian flavour in Bohemian design? Historically persecuted, the travelling Romani people are often associated with poverty, crime and perceived antisocial or inappropriate behaviour. Even today they are the victims of unwarranted discrimination and are made to feel unwelcome. Which begs the question – if they were so unwanted and disliked, why are we so fascinated with them and why do we emulate their fashion and style? And how on earth did this word come to describe the poor artists of Paris in the nineteenth century? The term Bohemianism first emerged in the early nineteenth century during a time when financially struggling artists, writers and musicians began to populate the lower-rent, lower class, Romani neighbourhoods of France. Many artists were frustrated by the confines of the stodgy and small-minded bourgeois middle-class life which focused largely on propriety and conformation. The photograph of Moulin Rouge at the tail-end of the bohemian revolution. The 2001 film “Moulin Rouge!” reflects the Bohemian lifestyle in Montmartre at the turn of the 20th century. Some French bohemians photographed in 1914. The care-free vagabond lifestyle and merry poverty of Romani people captured the imagination of these discontented artists. Many writers and artists of the time romanticised the concept of living below the breadline and suffering for ones art. Rebelling against social and cultural norms, the artist now found freedom in living eccentric, flamboyant and, sometimes, sexual promiscuous lives. New emphasis was placed on creativity and individual expression not only in their work but also in the way they dressed and lived – often unfashionable, threadbare and bright. People likened the new artistic types to wandering Gypsies and so the Bohemian counter-culture was born – indicative of a lifestyle rather than a nationality. Over the last century or so the spirit of this style has seen a few revivals and reincarnations. There have been several Bohemian movements, from the Beatniks of the 1950s to the free-love Hippies of the 1960s & 70s. What about the Bohemian “style”? While the non-conformist spirit of the movement stayed much the same, many contributed to outward appearance of the Bohemian Style we know today. Throughout the 20th century many adopted Bohemianism in some way or form and each left his or her unique stamp on the Bohemian aesthetic. The Pre-Raphaelite movement for instance, transferred a measure of their fascination with medieval folklore to the Bohemian Style. Their work was often dreamy, romantic and mystical, filled with yearning. 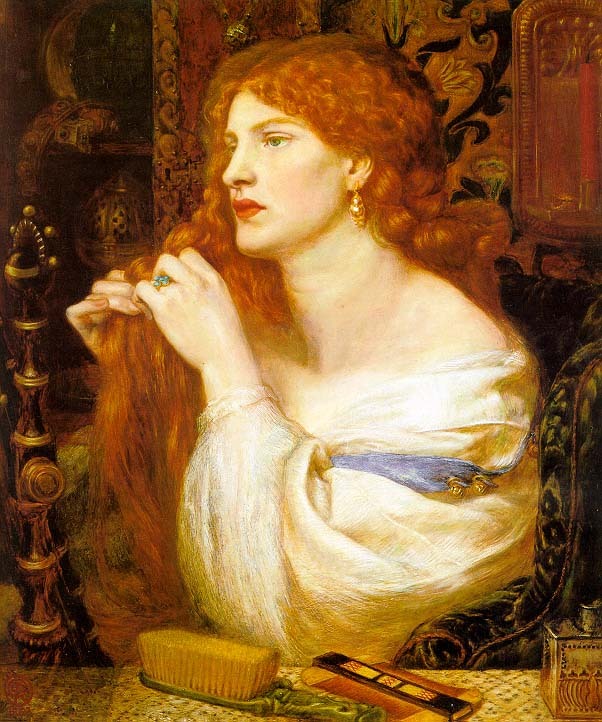 In fact Dante Gabriel Rossetti, a founding member of the Pre-Raphaelite Brotherhood, came to be seen as the “grand prince” of English bohemianism. Another famous Bohemian, William Morris father of the Arts and Craft Movement, had a profound influence on interior decoration throughout the Victorian period, designing tapestries, wallpaper, fabrics and furniture. Then there were bohemian sirens like Dorelia McNeill, muse and model for the Welsh artist Augustus John, who further popularised the Bohemian lifestyle and fashion. Dorelia’s step-granddaughter, 1960s bohemian fashion icon, Talitha Getty was famously enamoured with Marrakesh. I wonder if Talitha’s love for all things Moroccan is the reason why Bohemian interiors have such a strong Moroccan flavour today? Talitha Getty, the patron saint of Bohemian Chic, here famously photographed with her husband in Marrakesh, Morocco in 1969. Then came the swinging sixties – a true re-embodiment of the French Bohemian movement of old. Just as Bohemians used art and writing, hippies used their distinct music to rebel against authority and define a whole generation. Hippies borrowed many of their fashion ideas from the Parisian Bohemians and gypsies of the Czech Republic. The hippies of course put their own spin on the Bohemian style often incorporating non-Western elements. Native American, Asian, Indian, African and Latin American motifs were very popular. Amazing to think all these various people, movements and elements contributed to the eccentric and colourful Bohemian Style we know today. A Bohemian hippie couple at home. Photo taken at Taylor Camp, a late 60s hippie commune, located in Kauai, Hawaii.